A fourth-year and Charlottesville local, Patrick is looking into double majoring in Psychology and Biology with a minor in Bioethics. He is involved with One in Four, Honor Dorm Reps, the leadership retreat PULSE, Madison House, and Beta Theta Pi. A fourth-year from Manhattan, New York, Isabelle is currently pursuing Biology, Economics, and Entrepreneurship as an undergraduate at UVa. On Grounds, she is involved as the TEDxUVa Chair of Speakers Committee, the Partnerships Coordinator at HackCville, a community for creative students interested in entrepreneurship and start-ups, and a member of her sorority, Zeta Tau Alpha. Mary Garner is a fourth-year from Fluvanna County Virginia, about 20 miles from Charlottesville. 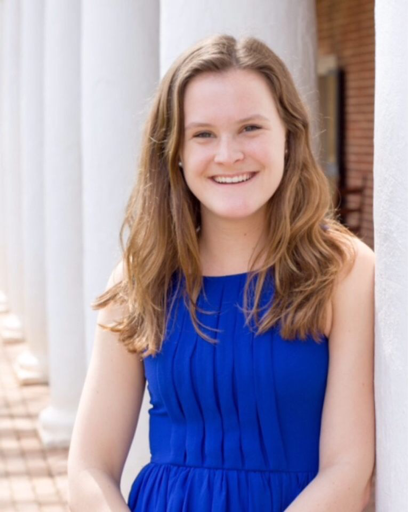 At UVA, Mary Garner studies politics and is involved with the Roosevelt Society, The Fireside Chats for Echols Council, Sustained Dialogue, the International Relations Organization, the Global on Grounds Committee, and she serves as a Resident Advisor in First Year Dorms. She loves to travel and has studied abroad twice, first on the Fall ’14 voyage of Semester at Sea and then at the Dalai Lama Institute in Bangalore, India in the summer of 2016. Alex is a fourth-year from Ashburn, Virginia hoping to major in Human Biology with a minor in psychology. 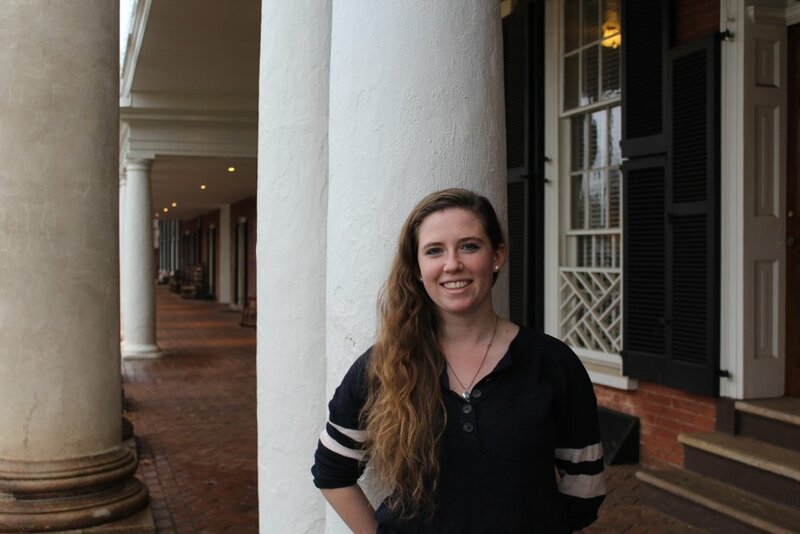 Outside of academics, Alex spends most of her time as a medical scribe in the UVA emergency department, a house manager at Old Cabell Hall, and the outreach chair for the Bioethics Society. She is also highly involved in her sorority, and loves anything related to babies, puppies, and chocolate chips. A fourth-year from Houston, Texas, Megan is interested in Politics, English, and the interdisciplinary Environmental Thought and Practice major. She also intends to pursue a Master’s in Public Policy from U.Va.’s Batten School in either the five-year or Accelerated Undergraduate program. Megan is a probationary committee member for the Jefferson Society, the Vice Chair for First Years on the University Judiciary Committee, and a member of the fundraising committee for Habitat for Humanity. She also spends her time volunteering on grounds as an Arts Mentor and Sustainability Advocate. From Memphis, Tennessee, Leeraz is a fourth-year studying public policy and commerce. Outside of class, Leeraz works as a research assistant in the Batten School. She is also involved in the University Guide Service, Student Council Academic Affairs Committee, her sorority Delta Gamma, and as an Associate Producer for the Pioneer, an online student media publication. Jesse is a third-year from Seoul, South Korea. Having declared a major in Astrophysics, he aspires to explore the world we live in under a mathematical framework. To probe the most fundamental constituents of matter, he is involved in Particle Physics research at the CMS detector of CERN; to investigate the grandest scales of the universe, he researches in Cosmology at the National Radioastronomy Observatory. Outside of physics, Jesse enjoys playing the guitar and is a member of O'Records, a student music group on grounds. His true passion, however, is brewing coffee. Lindsey is a third-year from Richmond, Virginia, studying computer science and entrepreneurship on a pre-dentistry track. On Grounds, Lindsey is a participant in HackCville's brand new "Hack Track" program, a collegiate member of the National Society of Black Engineers, and a member ofWorks in Progress, where she is actively pursuing an entrepreneurial project alongside other student entrepreneurs. She also is a member of the UVA Office of Admissions Outreach Team's Student Admissions Committee and the University Achievement Award Graduation Planning Committee. Outside of school, Lindsey enjoys exploring new places, spending time with friends and family, volunteering with the U.S. National Park Service, and working with CodeVA, a non-profit that helps expand access to computer science education. One of the highlights of her first year at UVA was studying abroad in Saint Kitts and Nevis during the 2017 J-Term. Aurora didn’t make a bio so she get’s this neat placeholder instead. A third-year hailing from Seattle, Washington, Aurora is a really groovy human who seems to really appreciate all the joys of life. Amelia is a third-year from Arlington, Virginia (another NOVA kid, sorry). Although currently undeclared, she plans on majoring in psychology and possibly pursuing global sustainability as a second major. On Grounds Amelia works as a research assistant in a psychology lab, is a committee chair for Take Back the Night, participates in One Less, and is a member of the outdoors club. Aside from that, she is currently trying (and failing miserably) to learn to play the ukulele in order to fulfill a lifelong dream of having some sort of musical talent, and always manages to find time to squeeze in some good old Netflix binge-watching. Emma is a third-year from Alexandria, Virginia. She’s studying politics and religious studies and is interested in applying to the Batten School of Leadership and Public Policy. On grounds, she is a volunteer with Madison House at Westminster Child Care Center, a mentor in College Mentors for Kids, and a member of both University Democrats and Sustained Dialogue. If she’s not in the classroom, you can find her binge watching Friends or watching the sunset on Humpback Rock. Abby is a third-year from Boston, Massachusetts hoping to major in Environmental Science with a minor in Biology. At UVA she is involved in Green Grounds, plays on the Club Ice Hockey team, and is a member of the Kappa Delta sorority. She is passionate about marine biology and loves hiking, playing with her dogs, and jamming out to the Hamilton soundtrack. Rohit is a third-year from Cincinnati, Ohio, majoring in Computer Science and (perhaps) Public Policy. On Grounds, Rohit is the President of the Balz-Dobie Association Council, an Honor Liaison, Keeper of the Jefferson Literary & Debating Society, Vice Chair for the Virginia Model UN conference, Chair of Undergraduate Life for the Student Member of the Board. When he’s not busy with school, Rohit enjoys hammocking, good conversations, and late night adventures. Hema is a third-year from Chesapeake, Virginia hoping to double major in math and economics. Outside of class, Hema is involved with the Fireside Chats committee for Echols Council, Madison House Music Mentoring, Madison House Adopt-A-Grandparent volunteering, the Indian Student Association, University Democrats, and a consulting group called SEED (Student Entrepreneurs for Economic Development). She also plays the piano and the violin and is in Kinetic Sound, a student-run instrumental music group. Hema loves to travel and will be studying at the London School of Economics this summer. Ben is a second-year from Washington, Pennsylvania and is hoping to double major in Economics and Statistics. Outside of academics, Ben is involved in the student-run chamber music group Kinetic Sound, plays in the Cavalier Symphony Orchestra, takes piano lessons, and is a program coordinator for HackCville’s data science track. In his free time, he enjoys playing tennis (terribly) and searching with friends for the best cup of coffee in Charlottesville. A second- year from Louisville, Kentucky, Shriya is looking to study Foreign Relations and French. On Grounds, she is an exec board member of the Indian Student Association, does volunteer work with Madison House, and is a member of the International Relations Organization. Outside of class, Shriya can be found traveling with the Model UN team, binge watching Bob’s Burgers, and sipping on Kentucky’s finest: Ale-8 soda. 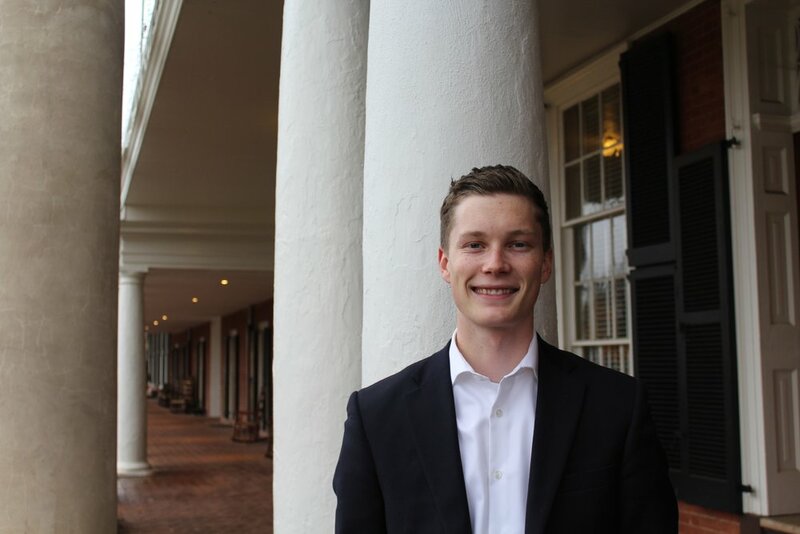 Connor is a third-year from Richmond, Virginia, majoring in Chemistry with a specialization in Materials Science and minoring in Applied Mathematics and Religious Studies. On Grounds, he is an academic peer advisor for ULink, a peer buddy for Best Buddies, and a research assistant for Dr. Jerrold Floro in the Materials Science department. Outside of class, Connor loves to explore the local Charlottesville area, spend time with friends on the Lawn, and support UVA basketball. He is also an avid lover of absurd, hypothetical questions and every dog he meets. Maitri is a third-year from Ashburn, Virginia double majoring in Religious Studies and hopefully Global Public Health, and is planning to utilize these areas of study in her attempts to pursue medical school in the future. She spends her time TAing for Chem1810, being a research assistant at the UVA Institute of Law, Psychiatry, & Public Policy, and helping out around her residential area by participating in the Bice-Language House Association Council. You can also find Maitri chatting with her Spanish-speaking friends at UVA's residential Spanish House, Casa Bolivar, or spending time embracing her culture through Indian Student Association and her Indian-dance team, HooRaas. In her free time, she loves attending UVA basketball games (GO WAHOOS!). watching Netflix, and splurging on Roots from the Corner. Emily is a second-year student from Charlottesville, Virginia, hoping to major in Statistics. On Grounds, she is involved with PAFN (Peer Advising Family Network), a peer mentoring organization for Asian/Asian Pacific American students; Kinetic Sound, an instrumental music group; and Madison House volunteering. She loves running, playing piano and guitar, and spending rainy afternoons making dozens of origami stars. Katherine is a second-year student from Clarke County, Virginia majoring in English. Her other academic interests include Russian, Classics, religious studies, and history. On Grounds, she is a member of the Jefferson Literary and Debating Society and Catholic Hoos. In her spare time, she can be found reading and writing, as well as watching movies, football, and hockey. One day, she hopes to have written the kind of stories she most loves to read. Until then, she will be anxiously anticipating the next installment of Star Wars. Anna is a second-year from Alexandria, Virginia. She is planning on majoring in physics, and possibly minoring in math or economics. Anna loves playing trombone in the UVA Jazz Ensemble, and the highlight of her first semester at UVA was her face being projected onto the Rotunda with the jazz band at the bicentennial celebration! Anna also loves to nerd out with the quizbowl team and the model UN peeps. Lastly, Anna rides her UBike around Grounds as a UBike ambassador, which comes in handy when she is late to class. Rachel is a second-year who hails from the wonderful midwestern metropolis of Omaha, Nebraska. She is planning to declare a major in Government and a minor in Spanish in the near future. She is involved in Best Buddies, works as a Data Research Assistant for the UVA Physics Department, and is Treasurer for the Roosevelt Society, a nonpartisan political dialogue group on grounds. She can commonly be found pointing out Nebraska on the map to those who “weren’t aware” that people ACTUALLY live there and loves drinking tea and making Vine references incessantly. Salem is a Second-Year from Burke, Virginia, planning to double major in Economics and English, with a minor in Mathematics. On grounds, Salem is the President of Flux Poetry and Spoken Word and a member of the 2018 and 2019 CUPSI (College Union Poetry Slam Invitational) teams. She is also involved with theatre on grounds, having been assistant lighting designer for a Spectrum show, and a cast member in the Black Monologues. She loves NPR and late night runs to Cookout with friends. 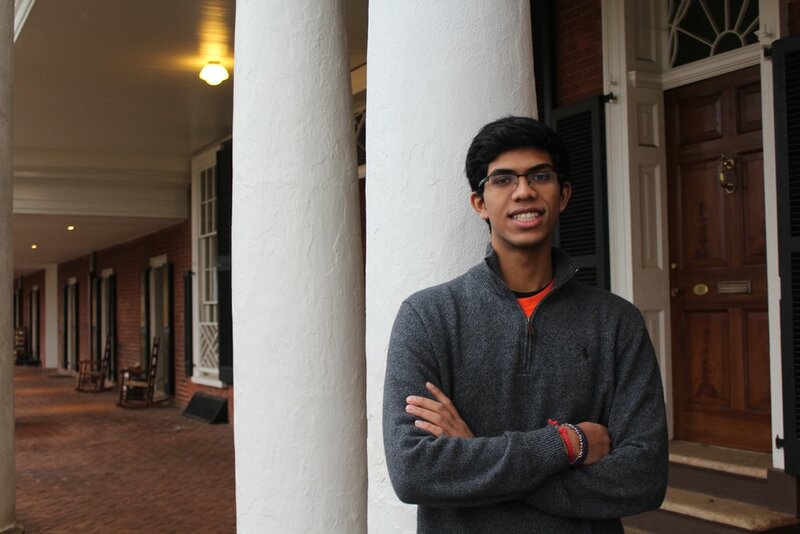 Vishnu is a First-Year from Roanoke, Virginia and is hoping to major in Human Biology and minor in Economics. Outside of class, Vishnu is involved with the Charlottesville Debate League and the Indian Student Association. In his spare time, he can be found rock climbing, playing racquetball, or hiking with his friends. Olivia is a First-Year from Fredericksburg Virginia, hoping to major in Global Public Health and minor in Psychology, on a pre-med track. At UVA, she is involved in Human Animal Support Services, where she volunteers at the Charlottesville-Albemarle SPCA, and plays cello in the Charlottesville Symphony. She also hosts prospective students through Monroe Society. In her free time, Olivia enjoys watching Criminal Minds, cooking with friends, and bringing her dog to visit Grounds. 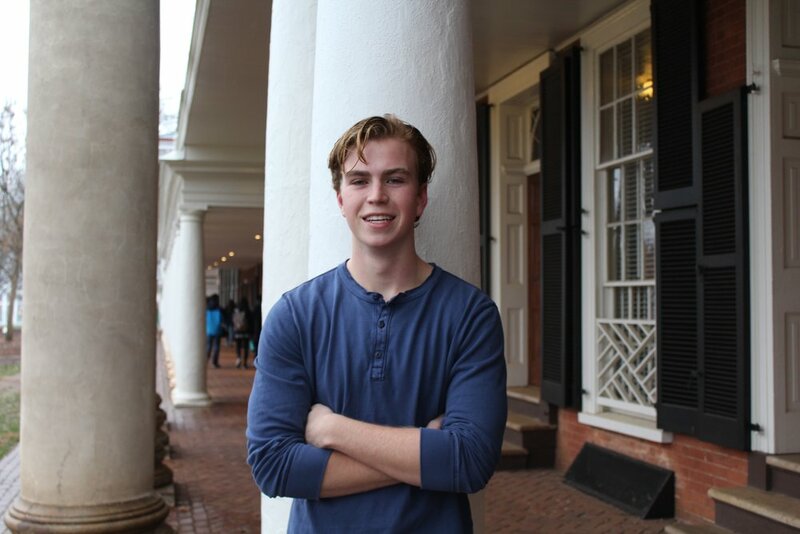 Quinn is a First-Year from Richmond, Virginia who plans to apply to the McIntire School of Commerce with a minor in Statistics. Around Grounds, Quinn works on Echols Council, is a member of the Sports Business Society, competes as a racer on the club ski team, and participates in Greek Life. Outside of the classroom, Quinn loves all things Game of Thrones and you can always find him cheering on a Boston or UVA sports team. Nicole is a First-Year from Long Island, New York interested in double majoring in Cognitive Science and Media Studies and minoring in Technology Entrepreneurship. She is involved in Women in STEM, volunteers with Challah for Hunger, and is a member of the Society for Cognitive Science. She loves traveling and cheering on the Hoos at UVA sporting events. A First-Year from Woodbridge, Virginia, Magin hopes to follow his academic passions of helping others through pursuing a double major in Government and Commerce. The son of Salvadorian immigrants, Magin is involved on grounds as part of the Future Business Leaders of America PBL, the WUVA media marketing team and the Latinx Student Alliance. He is also a member of the newly launched McIntire Commerce Cohort initiative and the second Latinx Leadership Institute Cohort. When he takes a break from studying, he enjoys hanging out with friends, drinking coffee, and listening to music. Bel is a first year from New York, NY. She intends to pursue a degree in economics and potentially foreign affairs. She is part of the Washington Literary and Debate Society, participates in Sustained Dialogue, will ski with VASST, serves on the Student Dining Advisory Board, and loves spending time with local Charlottesville kids via the tutoring program Peanuts and Cracker Jacks. Aaria is a Second-Year from Haymarket, Virginia, studying neuroscience and Spanish on the pre-medical track. She is a research assistant in a social neuroscience lab, a resident advisor, a volunteer in the Emergency Department at UVA hospital, and a VISAS volunteer. In her free time Aaria enjoys going to the AFC, hanging out with her residents, listening to Spanish music, and exploring Charlottesville. James is a Second-Year from right here in Charlottesville, Virginia. His interests include Public Policy and Politics and would love to talk your ear off about either! James is a member of the all-male a cappella group The Virginia Gentlemen as well as a volunteer at the UVA LGBTQ Center. His hobbies include running, singing in the shower, and doing laundry at his parent's house.